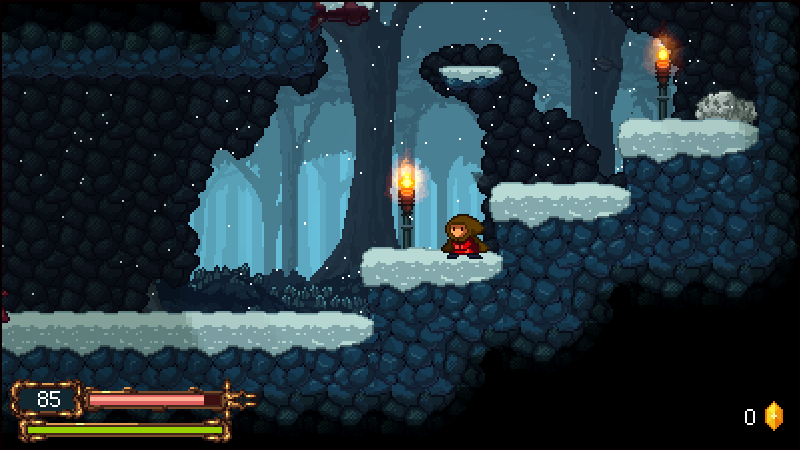 Ditched a bunch of the dithering, felt a bit noisy, also upped the saturation a tad. Okay, I'm done messing around with it; Dash Attack officially a move! 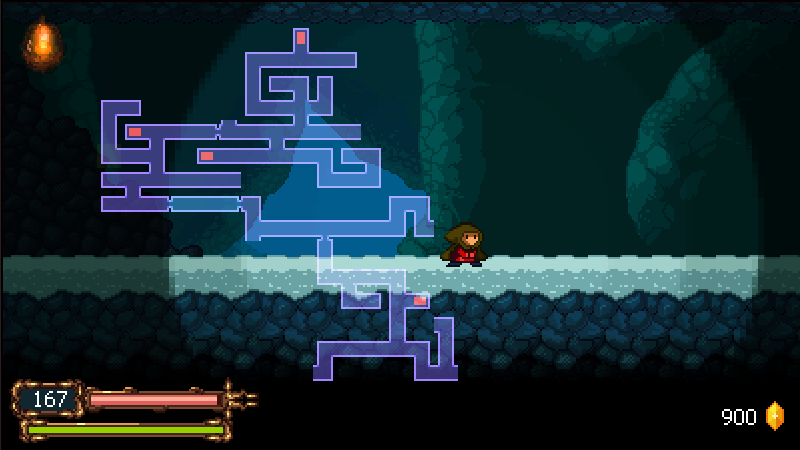 The little bar to the top-right might be familiar to those of you who have played Devil May Cry. In those games the idea is that the higher rank you score, the more points you get to buy new stuff with. It is determined by how well you beat the stuffing out of your enemies without getting hit in the process and use variation in your attacks. In Jarvis the idea is that it will decide how high the EXP, Gems and Item Drop Chance will be. I am also removing the "attack variation part" out of the equation as I don't think that particular detail will work as well in Jarvis. So when fully implemented: If an enemy dies while your ranking is at a specific level, that will determine what you'll get. Rank D = 1 Gem, Bonus 0% EXP, and Bonus 0% Drop Rate. Rank C = 2 Gems, Bonus 2.5% EXP, and Bonus 1% Drop Rate. Rank B = 3 Gems, Bonus 5% EXP, and Bonus 2% Drop Rate. Rank A = 4 Gems, Bonus 7.5% EXP, and Bonus 3% Drop Rate. Rank S = 5 Gems, Bonus 10% EXP, and Bonus 4% Drop Rate. The Numbers would most likely have to be tweaked but that's the idea at least. Also I'm not sure I'll go with ranking letters. Perhaps a flame that burns brighter and intense as you fill that bar? Perhaps 2 more animation frames or so and I think I can can call him done. Also he is not as easy as it may appear. This took several attempts to record without getting caught in his smash radius. Hit and run tactic is definitely required to handle this guy! Pressing the Map key will have it show up and cover the center of the screen(instead of the top left corner where I now will be putting in something else). On a side-note I really think the ranking bar is working out great so far. Happy I listened to feature creep. Thank you, I really hope the combat lives up to expectations! No worries, feedback is what I'm looking for! Is there any particular aspect of the character that was hard to resonate with? Even some kind of seal on his cloak would be pretty neat. That sounds interesting. Personally, I find the main character very fitting for some reason. Even though, come to think of it I've only seen the screenshots and haven't seen what the story is about other than it looks like he's on some kind of quest. Looking at the first page, it doesn't seem to be mentioned though but that likely won't change my opinion. It's true, I've been really vague on the story. It's mostly because up until like a bit over half a year ago I still wasn't very sure what I really wanted to go with though I always had a rough idea in mind. 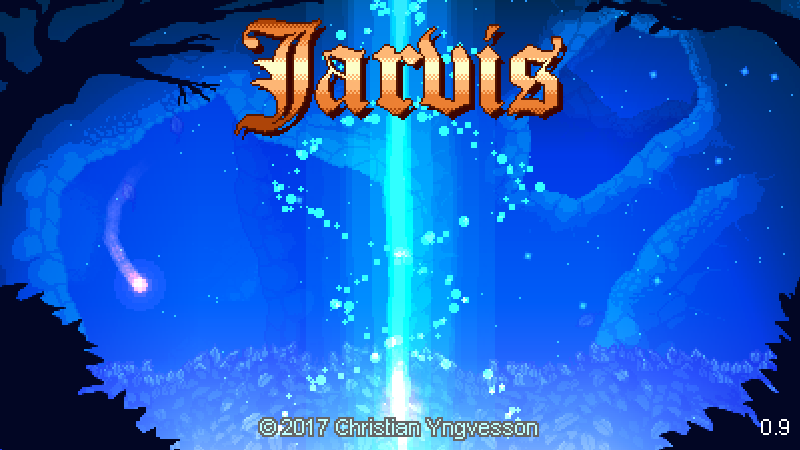 Eventually I decided that Jarvis is a magic entity(in the form of a warlock) conjured up from "failed" ritual that takes place right at the beginning of the game. He looks like any other "normal" person in this world but he is more or less just artificial with magic abilities, hence the energy blade and the spell casting(so I guess Jarvis is kind of like Megaman in that aspect just not a robot). That is also really the reason why you collect soul fragments to learn new abilities. They're literally pieces of Jarvis spirit that scattered all over the world before you get to play. What you just described for story/backstory sounds pretty cool! I don't have a problem with the PC, but I do agree he could probably use...something, to make him a bit more unique. I can relate, I didn't know if I wanted to go in a fantasy direction or a strictly real life kind of plot so I was pretty vague about my game but I'm pretty sure it's going to be a blend. In that case, it would be possible that he's dressed like a "normal" person because he found or took those from a "normal" person. However, with that description in mind, I do agree that it'd be better to make him look special. In terms of motivation, is trying to "put himself together" the only motivation or is there something else that he wants?